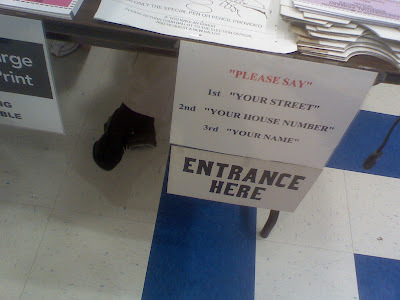 The “Blog” of “Unnecessary” Quotation Marks: "please say"
The quotation marks manage to convey precisely the opposite meaning to the one they wanted. There, what do I win? I think that's where I voted... I didn't even notice the sign. I love the placement of the "Entrance Here" sign. Makes me think I have to crawl underneath the table.